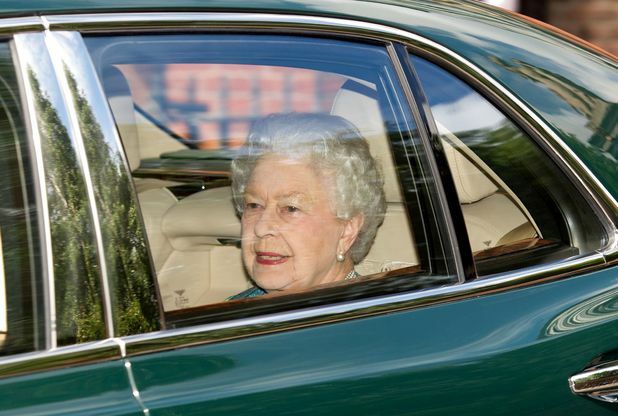 The Queen in her green limousine. In 2008 we made a trip to England. Joan’s brother was on sabbatical, and he and his wife were living for the year in Cambridge. Never having visited England, we took them up on their invitation to come for a visit while they were there. In addition to Cambridge, we visited many interesting places while we were there including Stratford-upon-Avon and the village of Fincham where Greg’s paternal grandmothers’ family had come from some 250 years ago. In London we visited the Tower of London, the British Museum, the National Portrait Gallery, and other memorable places. One afternoon we attended a concert at St. Martin in the Fields. Greg had some great (too many greats to list!) grandparents married in that very church in 1633. But of all our memories, one quite dramatic one stands out. It was the afternoon Joan was almost run over by the Queen of England. We were just leaving Buckingham Palace to go for a walk in St. James’s Park. We had the green light to go ahead and cross the street at a crosswalk near the palace. As we were crossing, a fast moving motorcade escorting a green limousine appeared and honked urgently at us to get out of the way. Greg had already cleared the crosswalk (as was his habit, he didn’t always wait for Joan). The motorcade didn’t stop for the red light and sped through the crossing. Joan barely got out of the way in time. Shortly after, we noticed that a flag had gone up a previously empty flagpole at Buckingham Palace. Later, discussing the episode, it occurred to us that Joan’s vehicular assailant might have been someone important, maybe the queen. So, was Joan almost killed by the Queen? A dubious claim to fame, but an interesting memory of a notable day in London.